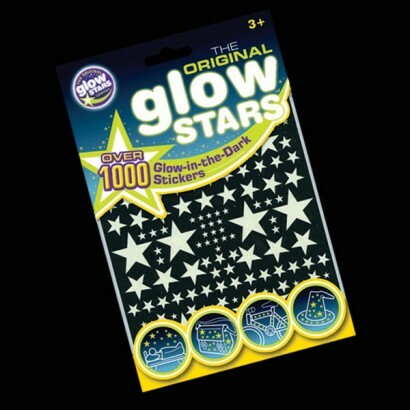 1000 glow in the dark star and cosmic shape stickers. 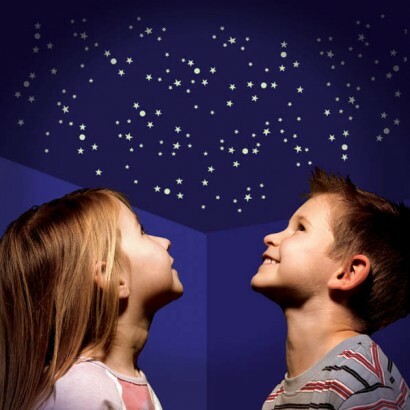 Cover any room with these indiscreet glow stars that when exposed to light for a few minutes will glow for up to an hour. Children cant wait to turn out the lights! Four small sheets with planets, rockets, clouds, UFO's, Moons and even more glow stars! Over 600 stars plus a multitude of moons, ufo's, rockets, clouds, planets and more! I knew I was getting paper stickers as I'd read previous reviews. They were a bit of a pain to put up as they were so small and difficult to get off the backing paper but all the effort is well worth it. My son now has a realistic night sky in his space themed bedroom - he was over the moon when he saw it! I was excited to put them up on my ceiling. I found it easiest to but them put in the dark with just a lamp on and using my phone torch as they will glow and you’ll see them better. I put them up in actually constellations using a map. I’ve seen many reviews saying that they don’t glow for long but mine glow for around 20 mins, what else do you want for the price really? Also about the stickers peeling off I did find a few did (like 5/50) but it’s no biggie and they all fell off within like ten mins so can easily be replaced however the rest have stayed on for months. Overall, a great product! We covered our son's ceiling in stars, doing all the constellations in the right place. It looked amazing. Then we moved house. So I've bought them all again and currently in the middle of sticking them in the ceiling again. I'm really looking forward to seeing my sons face when he sees his newly decorated room! Awesome!